This bath sized towel is 100% ringspun cotton and is personalised with name and a grey whale embroidery motif. 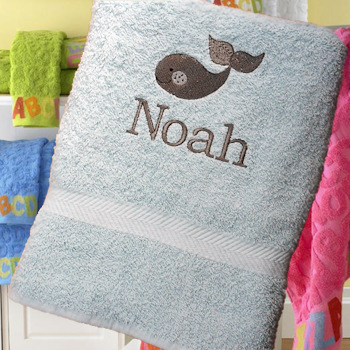 This bath sized towel is 100% ringspun cotton and is personalised with name and a grey whale embroidery motif. Great for swim lessons too! This towel looks great in the bathroom and at the swimming pool. Select the towel colour you prefer. Bath sized luxury 550 gsm cotton towel. Personalised with your choice of name in a thread colour and letter font style of your choice.